To know that you are trespassing on someone, or something, else’s territory does not always need signs and fences. When you are over two thousand metres up the side an (almost) extinct volcano range, shrouded in a chilled mist and squelching your muddy way through other-worldy trees, vines and grasses, you quickly realise this is another animal’s domain. If you are in Rwanda, within the 3,000 square mile Virunga National Park, then that habitat belongs to around 480 protected gorillas. Having booked a gorilla permit some months in advance for $750, one could not help but feel a sense of growing anticipation. 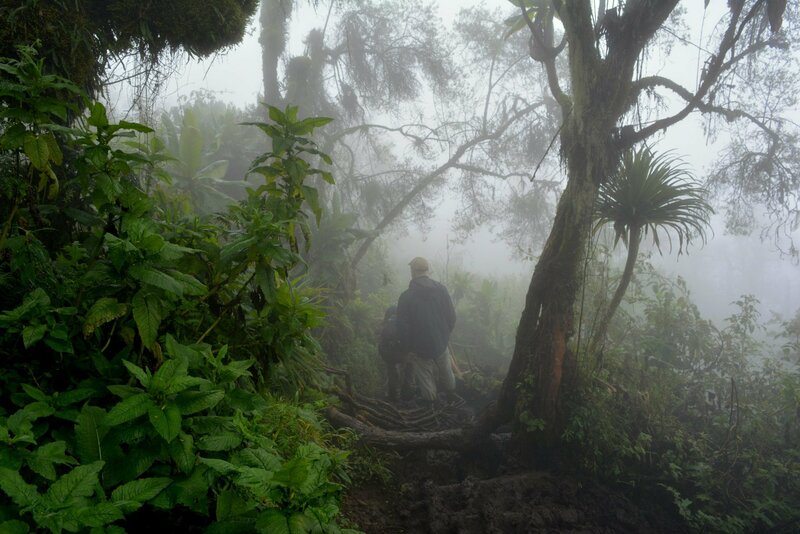 Our group of a dozen or so, of mixed ages and nationalities, took a steady hour and a half walk out through the villages and fertile farmers’ potato fields at the foot of the volcanoes and up steep slopes into the rain forest. Accompanied by two guides, who knew their subject matter and tourist patter well, and four or five armed military personnel, our final weave through a dense copse of bamboo opened out to a large family of habituated gorillas at restful play. The Agasha group, whom we were visiting, were one of the first to be habituated, becoming comfortable with human observers visiting them. We crouched within four or five metres of them, careful not to disturb them. They knew we were there though; they had known we were approaching for some time, long before we had known how close we were to them. Joyfully, the young infants tumbled out of trees, over each other and occasionally us. Their mothers sometimes retrieving them but mostly letting them play. The adolescents engaged in more boisterous tomfoolery, as well as indulging in a spot of relaxed mutual preening. The silver back sat with his back to us, impervious to our presence. He casually grabbed the odd tree or branch, bent it over towards himself with ease, had a good chew on the freshest looking foliage before releasing it, springing back upright. The group fancied a change of scenery, perhaps for some fresher foliage but also mindful that they had to make their night time nest in the trees, as they do afresh every day. We were slightly in their way, with one of our number receiving a punch to the breast from a grumpy mother, feeling her route was not clear enough. The recipient of the cautionary blow was a middle aged American lady who thought it “awesome” and no bigger smile could have been brought to her face. The Agashya group spread out, all stripping leaves and munching away. We sat mesmerised. The near human dexterity and interaction, along with the size of these primates, was captivating. We were permitted only one hour with the gorillas, which felt like it was over before it had started. As we walked back down the muddy trails, all were lost in the preceding hour, either in hushed conversation or silent introspection. As we descended, we were leaving a precious world that rightly belongs to the gorillas; where we humans are but trespassers, where we should visit but never stay. We just had an incredible experience – two, actually! 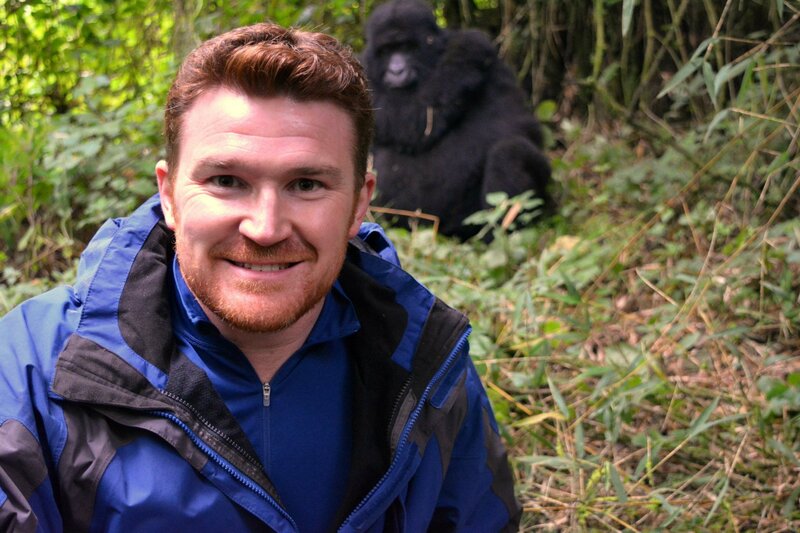 – gorilla trekking in the DRC and it was absolutely awe-inspiring. I haven’t had a wildlife experience that surpasses it (safaris are great, but not the same), and it’s something I’d highly recommend to everyone. Such amazing animals!